Boy meets girl. Or girl meets boy. She smiles, he hesitates. Or she smiles, he smiles back. In a multiverse, the different possibilities of a first encounter send one relationship into a myriad trajectories. In a fugue of vignettes that ensue, a different word, a different look, a different choice will change the landscape of their destiny. Catch Cris Villonco and JC Santos in an unusual love story where science and romance collide. 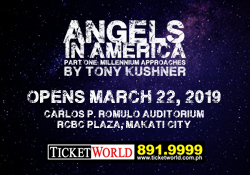 Opens February 12 and runs until March 6 at the Power Mac Center Spotlight Theater in Circuit Makati. Level 2, Circuit Lane, A.P. Reyes Ave., Makati City. For a summarized version of this show, click here. For more details about what’s happening in the Manila theater scene, please view our Theater Calendar.